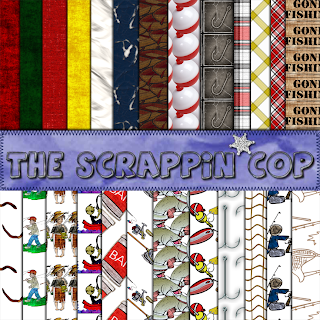 The Scrappin Cop: The Gone Fishin Patterns are finally here! The Gone Fishin Patterns are finally here! Have you all missed me? LOL, I'm having a great vacation at the Lake of the Ozarks but let me tell you what happened to us today... We were all enjoying life, fishing off the dock here at the resort and catching the bluegill by the hundreds (author embellishment) and we could see a storm coming from the other side of the lake. Ok, it was getting a little dark and the lightening was flashing and we could see the rain coming accross the lake in sheets.... and my mom and dad decided they were going to head for the hills because the worst place to be in a thunderstorm is a metal dock on a lake (hmmmm, never did listen to my parents....). Luckily they took Kyleigh (the 3 year old) with them. The rest of us weren't so lucky. By the time we decided maybe we should head for shelter it was tooooooo late. All of a sudden there was horizontal rain (honestly) and things were blowing off the dock and into the water. 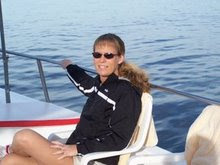 My DH, and my 11 year old and I were stranded on the dock as well as my brother in-law, sister-inlaw and their 2 boys and their little girl Izzy who is only 2 years old. We huddled behind a big boat that sheltered us from the wind but not the rain. It was horrible, one of the boys tried to run for shelter and he was knocked down! My sister in-law found a huge boat on the dock that was open and told us to take shelter. Well - my DH said - let's just make for the buildings and we ran toward the shore but found that the dock walkway had broken away from the bank and there was no getting to shore without swimming. UGH. So we took shelter in the boat and my brother in-law found a life jacket in the big boat and swam for shore to make sure that the rest of the kids had made it to their rooms okay and to get his boat to come rescue us. My dad ended up rescuing us in his boat which was hooked to a different dock. He thought the whole tragedy was quite humerous since I scoffed at his leaving the dock when the storm was coming. Lesson learned. (maybe) Anyway, now to the reason you are all here - the gone fishin patterns. All the patterns on the bottom half of the preview image are on transparent backgrounds - I layered them over plain white so you could see what they look like but you can layer them over your favorite papers or the solid papers provided in the pattern set. There's also a cool fishing net overlay courtesy of a Filter Forge filter. I've also included a pack of the image tiles for my non- PS user readers. I'm working on the Gone Campin patterns and will get them posted soon! And while I love snagging your things, I also love reading peoples blogs for all their latest adventures, and you surely had a good one.. I am really glad you are all ok, sounds like there was some scary moments in all that.. Did your mom or dad say "I told you so" lmao.. sorry..
And I still havnt figured out the password thing, tried to do it the other day and passworded everything, opps lol.. Thank you! Your blog post will be advertised on the DigiFree Digital Scrapbooking Freebie search engine today (look for timestamp: 09 Jul [LA 12:38am, NY 02:38am, UK 07:38am, OZ 05:38pm]). Yikes! How scary! Thanks for the Fishing papers- I love them! Wow how scary!! I'm glad you all are okay now...guessing you will head for the hills next time you are on a metal boat dock and a storm is approaching. TY so very much for these MARVELOUS papers!!!!!!! Glad to hear that your all safe after all of that!!!!!!!!!!!! Goodness! You never cease to amaze me! Love this stuff! I'm always scrappin' fishing pages for my nephew. Thanks a bunch! thank you so much for another wonderful set ... I thought you'd like to know that the patterns and elements downloaded without any problem, but the link to the image tiles was blocked by Norton as having a virus...just thought you should know. 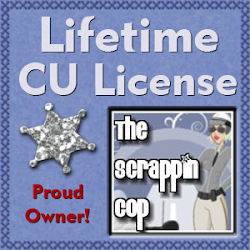 Thanks again for all you create and share. Darn! I spoke too soon...the 4shared links counted down, but then said links were not valid. Any chance you would reinstate them? Thanks again.